New Rochelle, NY, April 4, 2019–A new pilot study compared the use of human breast milk to formula in children less than 5 years of age who underwent bone marrow transplant (BMT), measuring the levels of inflammatory and pro-inflammatory biomarkers in the stool and blood to assess inflammatory injury to the intestinal microbiome. The results, indicating that human milk was associated with decreased markers of inflammation and injury in the stool, are reported in an article published in Breastfeeding Medicine, the official journal of the Academy of Breastfeeding Medicine published by Mary Ann Liebert, Inc., publishers. 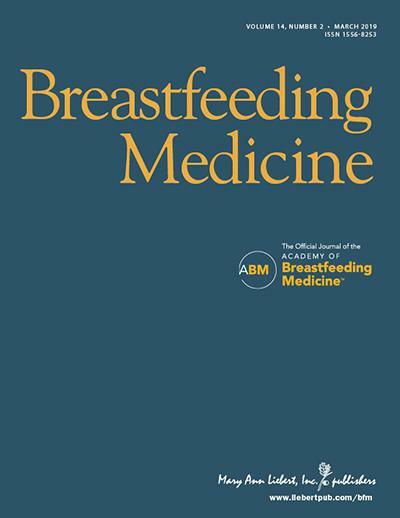 Click here to read the full-text article free on the Breastfeeding Medicine website through May 4, 2019. The high doses of chemotherapy and radiation administered before BMT initiates a cascade of events – including the release of cytokines such as interferons and interleukins – that can damage the lining of the intestines and alter the make-up of the intestinal microbiome. These and other changes involving T-cell activation can lead to the early stages of graft-versus-host-disease. Pooja Khandelwal, MD and coauthors from Cincinnati Children’s Hospital Medical Center (OH) and Prolacta Bioscience (Duarte, CA) designed a study in which the children undergoing BMT receiving human milk or formula beginning three days before and continuing for two weeks after the procedure. In addition to differences in inflammatory and intestinal injury markers, the article entitled “A Pilot Study of Human Milk to Reduce Intestinal Inflammation After Bone Marrow Transplant” also showed lower levels of various intestinal viruses and bacteria in the stool samples of children receiving human milk compared to those receiving formula. “While only a pilot study, it has the potential of being a stimulus for proper prospective randomized studies that will explore the value of human milk as adjuvant therapy in the management of all transplants,” says Arthur I. Eidelman, MD, Editor-in-Chief of Breastfeeding Medicine.